In today’s entry we’re going to provide some very basic operating instructions for the new Ohaus Aviator 7000 retail scale. 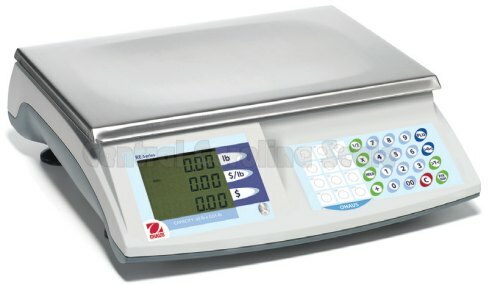 Of course, once you receive your scale you can immediately use your scale for weighing and selling. Check with your local state weights and measures for the correct procedures for your particular state. 1. Place the item on the scale. The price to pay is displayed. 3. Remove the item from the scale. All displays return to 0.
via the keyboard. So you do not have to tare the empty container. 1. Place the empty container on the scale. 2. Press the Tare key. The weight display is reset to 0.000 and the NET symbol appears. The tare weight is displayed in the bottom line of the display. 3. Fill the container with the goods to be weighed. 4. Carry out pricing as described above. 5. Remove the container from the scale. 1. Input the known tare value and press the Tare key. The input tare value is displayed in the bottom line of the display and the PT cursor is lit. The weight display shows the negative tare value. 2. Place the item with container or wrapping material onto the scale. 3. Carry out pricing as described above. 4. Remove the item with container or wrapping material from the scale. 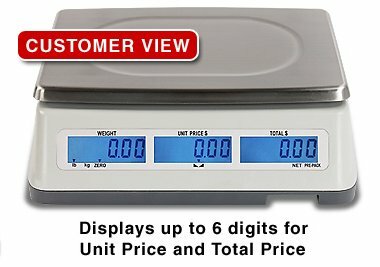 Over the years the Ohaus line of retail price computing scales has been a pretty solid choice for customers looking for a reliable, high quality scale. Of course the predecessor of the Ohaus RE15US and RE30US was the old XRT series scales. And of course before that we had the Tiger II scale. And finally before that it was the 8433 scale. All of those were nice scales that were fairly simple to use and they just worked. In fact, if you look closely, you’ll still see an old 8433 still in action at some small farmers market. Recently, we received word that Ohaus was going to be upgrading their retail scale lineup and replacing the RE and RA series. Below is a summary of the new scale and a link on where to purchase the new scale. The Ohaus Aviator 7000 retail scale has been conceived to offer optimum quality versus price in order to guarantee the robustness, operating speed and accuracy you need, whatever your retail environment. The Light-Touch layer keyboard is setting standards thanks to its fast operation, easy cleaning and cost efficiency, while the large 4-line LCD including separate tare line makes daily tasks simple. For secure and easy transportation the Aviator 7000 includes practical design features such as Ergo grips and integrated cable storage. In addition it offers POS protocol support. Overall the Aviator 7000 offers you a complete package of features rarely seen on an entry level price-computing scale – ensuring that it stands out from the crowd.